(a) Remove the steering wheel assy set nut. (b) Place matchmarks on the steering wheel assy and main shaft assy. 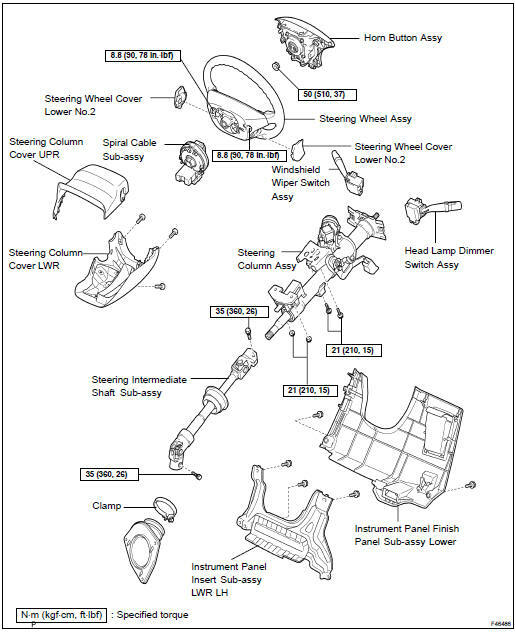 (c) Using SST, remove the steering wheel assy. (a) Remove the 3 screws and steering column cover LWR. (a) Loosen the bolt A and remove the clamp from the steering intermediate shaft sub-assy. (b) Loosen the bolt B. (c) Place matchmarks on the steering intermediate shaft sub-assy and steering gear assy. (d) Remove the bolt and separate the steering intermediate shaft sub-assy. (a) Separate the connectors and wire harness clamps. (b) Remove the 2 bolts, 2 nuts and steering column assy from the instrument panel reinforcement assy. (a) Place matchmarks on the steering intermediate shaft sub-assy and steering shaft. (b) Remove the bolt and steering intermediate shaft subassy. (a) Widen the claw hung on the upper bracket by approx. 1.0 mm (0.039 in.) using a screwdriver. (b) Pull the transponder key amplifier toward the rear of the vehicle with the claw open. NOTICE: Take care not to use excessive force to prevent the case from being damaged. (a) Measure the steering main shaft length. If the length is out of specification, replace the steering column assy with a new one. (a) Using a centering punch, mark the center of the 2 tapered- head bolts. (b) Using a 3 to 4 mm (0.12 to 0.16 in.) drill, drill in to the 2 bolts. (c) Using a screw extractor, remove the 2 bolts and steering column upper w/ switch bracket assy. (a) Using a snap ring expander, remove the steering main shaft snap ring (outer side). (b) Using a brass bar and a hammer, remove the steering main shaft assy and steering main shaft bushing. NOTICE: Be careful not to drop the steering main shaft assy. (c) Using a snap ring expander, remove the steering main shaft snap ring (inner side). (a) Place the ignition switch lock cylinder assy at the ACC position. (b) Push down the stop pin with a screwdriver, and pull out the cylinder assy. (a) Separate the un-lock warning switch assy connector from the ignition or starter switch assy. (b) Remove the un-lock warning switch assy by pushing up the center part and releasing the 2 claws. (c) Disengage the secondary locking device. (d) Using a small screwdriver, disengage the locking lug of the terminals 2 and 4, and pull the terminals out from the un-lock warning switch assy rear side. (a) Remove the 2 screws and solenoid from the steering column bracket assy. (a) Remove the 2 screws and ignition or starter switch assy from the steering column bracket assy UPR. (a) Install the ignition or starter switch assy to the steering column bracket assy UPR with the 2 screws. (a) Install the solenoid to the steering column bracket assy with the 2 screws. (a) Install the un-lock warning switch assy. (b) Connect the terminals 2 and 4 of the un-lock warning switch assy connector. (c) Connect the un-lock warning switch assy connector to the ignition or starter switch assy. (a) Make sure the ignition switch lock cylinder assy at the ACC position. (b) Install the ignition switch lock cylinder assy. (a) Check that the steering lock mechanism is activated when removing the key. (b) Check that the steering lock mechanism is deactivated when inserting the key and turning it to ACC position. 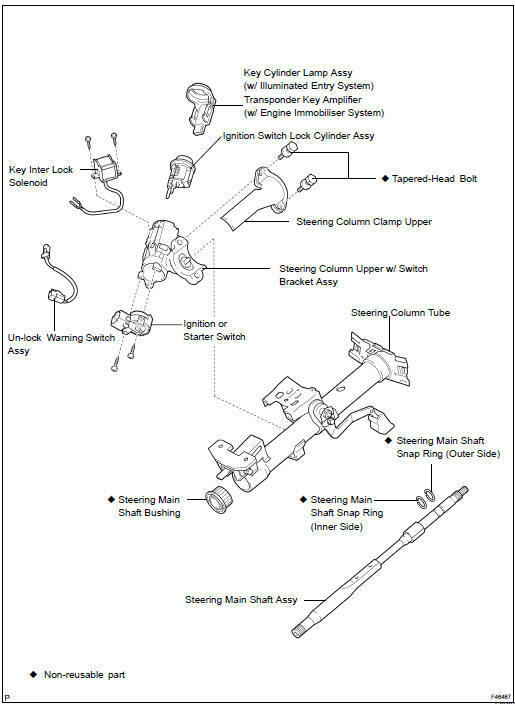 HINT: If there is any abnormality, replace the ignition switch lock cylinder assy. (a) Using a snap ring expander, install a new steering main shaft snap ring (inner side) to the steering main shaft assy. (b) Install the steering main shaft assy to the steering column tube. (c) Using a snap ring expander, install a new steering main shaft snap ring (outer side) to the steering main shaft assy. (a) Using SST and a hammer, install a new steering main shaft bushing. (a) Temporarily install the steering column upper w/ switch bracket assy and steering column upper clamp with 2 new tapered-head bolts. (b) Tighten the 2 tapered-head bolts until the bolt heads break off. (a) Align the transponder key amplifier with the installation position of the upper bracket with the amplifier inclined. (b) Push the transponder key amplifier up and connect it to the upper bracket. NOTICE: Take care not to push the amplifier up with excessive force to prevent it from being damaged. (a) Align the matchmarks on the steering intermediate shaft sub-assy and steering main shaft assy. (b) Temporarily install the steering intermediate shaft subassy with the bolt. (a) Install the steering column assy with the 2 bolts and nuts. (c) Connect the wire harness clamps to the steering column tube. (a) Align the matchmarks on the intermediate shaft sub-assy and steering gear assy. (c) Tighten the bolt A. (d) Connect the clamp to the steering intermediate shaft sub-assy and tighten the bolt B. (a) Install the steering column cover LWR with the 3 screws. (a) Align the matchmarks on the steering wheel assy and steering main shaft assy. (b) Install the steering wheel assy set nut.